Blackmail is when one individual or group holds information over another’s head to force them to do their bidding. Granted, this one has a slight twist; usually, blackmail consists of somebody having damaging information that will humiliate or damage their victim unless they submit. This time, the blackmailers—and only the blackmailers—have information that is the administration’s and students’ right to know. They have declared that the students and administration will not receive the grades unless they do what the graduate students want. According to a Chronicle of Higher Education article, 79 teaching assistants and instructors have pledged to withhold more than 2,000 final grades. There’s only one way to deal with blackmailers (unless lives are at stake), or forever be under their thumb. You call their bluff and take them down. Unless the UNC administration or governing boards are willing to take that step, all manner of other problems will arise. The most obvious of these problems is that the university will have handed control of the campus to blackmailers. What happens when the next controversy arises? Say, when a conservative speaker is invited by a campus group? Or somebody wants funding for a politicized activity? Or graduate students want actual union representation? Unless the school makes it clear that extortion will not work, they can expect this tactic to continue. Another problem is what will happen to UNC’s reputation—already shaken by the athletic scandal, the Tom Tancredo riot, previous developments concerning Silent Sam, and more. If the school capitulates to the activists, it could face the same sort of backlash faced by Evergreen State College in Washington and the University of Missouri when their administrations proved incapable of dealing with campus radicals. Both of those schools suffered large losses of applicants, students, donations, and state appropriations. Not to mention blows to any prestige they may have had pre-controversy. So, what should the university do? It’s simple: threaten to expel those participating in this so-called strike. Some of the activists may return to their senses for fear of destroying their academic careers. For those who fail to produce the grades in a timely fashion, the school should actually expel them and take back all of their grants, fellowships, and stipends that the school controls. If the activists’ academic careers are ruined, so what? When you not only disrupt your employer’s operations but deny the rights of clients (students) to what they have paid for and earned, then of course you should be sent packing. The public universities should not be some special sanctuary where no repercussions are ever felt no matter how you behave. One more problem may be the faculty or some part of it. The controversy could intensify greatly if enough faculty back the graduate student activists (and many faculty are spoiling for a political fight)—the campus could even be shut down until control is restored. Still, the dissenting faculty would be on just as wrong footing as the graduate students. This is not a matter of academic freedom; nobody’s right to propose ideas is being infringed upon. It is a matter of disrupting the operations of the campus, and the relevant court decisions come down on the side of the school. If the administration gives in to the faculty, it will be no different than giving in to the activists. Depending on what they do, faculty could also be liable for dismissal for disrupting campus operations just like the activists. It’s not as if the activists and any faculty supporters couldn’t be replaced. There could be a minor disruption for a semester or so, but there are large numbers of recent PhDs all over the country who are now teaching as adjuncts and who would be eager to fill in as contingent lecturers at a school like UNC, especially if the campus has a large number of full-time openings. And as far as the students’ missing grades go, it may be the university has to accept that they will never be known. One way to get past this particular type of blackmail is to just give all of the students’ whose grades are withheld an A—sometimes in life, you just get lucky. Also, the school could ask the affected students what they believe they earned. Obviously, many will give higher grades than they actually earned. But in the grand scheme of things, it’s more important to stand strong against the “strikers” than to have precise accuracy in students’ grades. After all, we’re talking about 2,200 grades in a school with roughly 16,000 undergraduate students, each taking four or five classes a semester. So the affected grades will be approximately three percent of the total—less if some of the activists cave in. And, in many of the subjects that the activists teach, more than half the grades are “A”s. Without control of the students’ grades, the activists have no cards to play. [The leadership’s] compromise plan to keep Silent Sam on campus—but in an isolated corner—was guaranteed to please almost no one. One more problem, though, is UNC’s leadership. 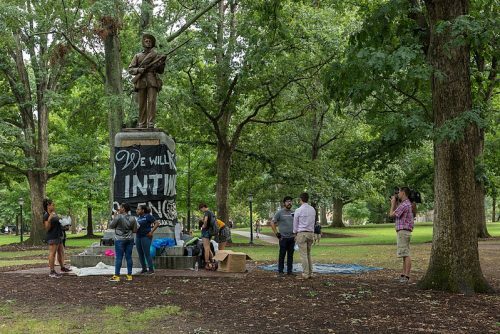 Their compromise plan to keep Silent Sam on campus—but in an isolated corner—was guaranteed to please almost no one. Some faction was going to be upset, and the anti-Silent Sam activists are absolutists who deny any views but their own. So far, UNC-Chapel Hill president Carol Folt has not shown lots of spine in her five years at Chapel Hill, and the thought of running afoul of faculty opinion must keep her awake at night. But because the activists are clearly unreasonable, Folt now has a fairly strong position: she can at least claim that she tried to make an honest attempt at compromise. Since the activists have progressed from mob rule to gangsterism, potentially harming innocent students in the process, Folt and the trustees have carte blanche to get tough. The administration has already suggested they may take legal action in an email by Kevin Guskiewicz, dean of the College of Arts and Sciences, and Robert Blouin, the provost. Given the mood on campus, they may have no choice but to act on that suggestion. The answer becomes clearer once one steps away from the left-wing echo chamber of the campus and into the 99 plus percent of North Carolina that is not academia. Although the very loud voices in the media and academia would be aghast if the activist graduate students were severely punished, the support in the state of North Carolina for strong action would be overwhelming. A Civitas Institute poll revealed that 70 percent were against the rioters who toppled Silent Sam, and now the activists are overstepping sensible boundaries even further into unhinged territory. Their lack of popularity is assured; they may even turn the student body against them for withholding students’ grades and negatively impacting their futures. This is really the decisive moment for Folt. She cannot afford another fumble. An important part of leadership means taking control. Taking control means being strong, even in the face of criticism. If she cedes control of the campus to radical malcontents, her tenure is over. Who will respect such a weakling? Not the people, not the Board of Governors, not the faculty—and especially not the activists. She will be their pawn. This is also a pivotal moment for UNC-Chapel Hill. No matter how big the flames get, the path is clear. Is UNC truly “the University of the People,” as liberals like to claim to support their causes? Or is it the special preserve of academics who hold in contempt the taxpayers who pay their salaries? Or does it belong to the radical fringe, to a violent mob turned blackmailing gangsters? The activists have thrown down the gauntlet; this is a fight that needs to be fought, and fought hard. 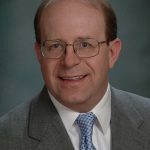 Jay Schalin is director of policy analysis at the James G. Martin Center for Academic Renewal.